Sometimes before actually writing a fully fledged review it’s useful to put down some raw impressions first. 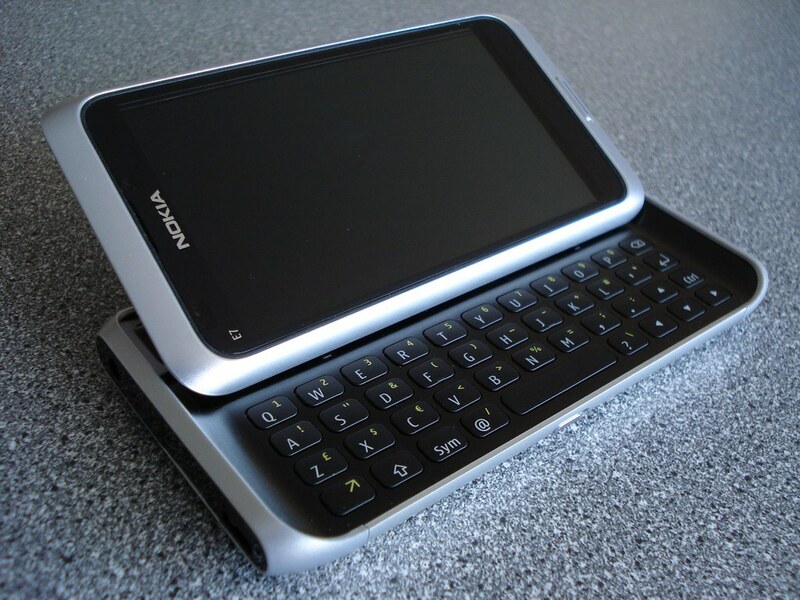 These immediate reactions of using the Nokia E7 might be able to convey a more vivid image than a perfectly constructed and though-out review. Of course, for every type of article there’s the best time and place. Now let’s get going! 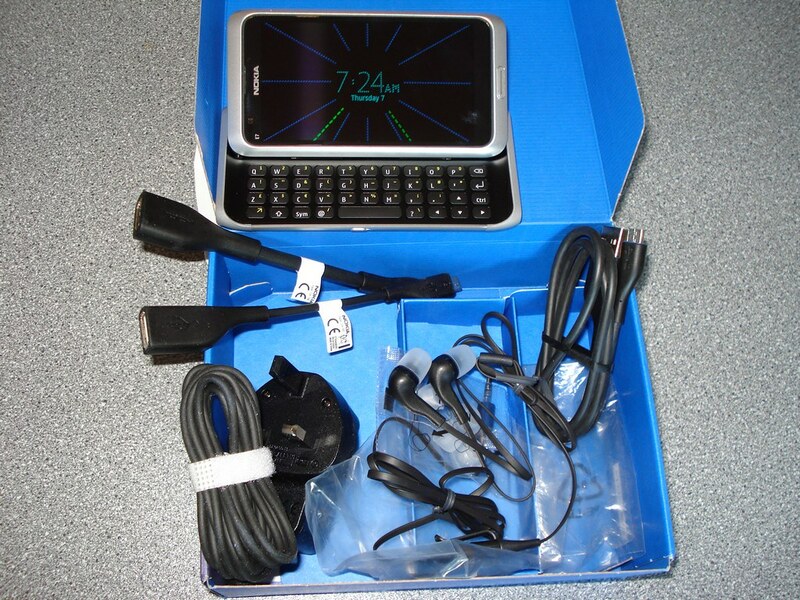 For a supposed flagship device, the Nokia E7 comes in one of the smallest and modest looking retail boxes I’ve ever seen so far. 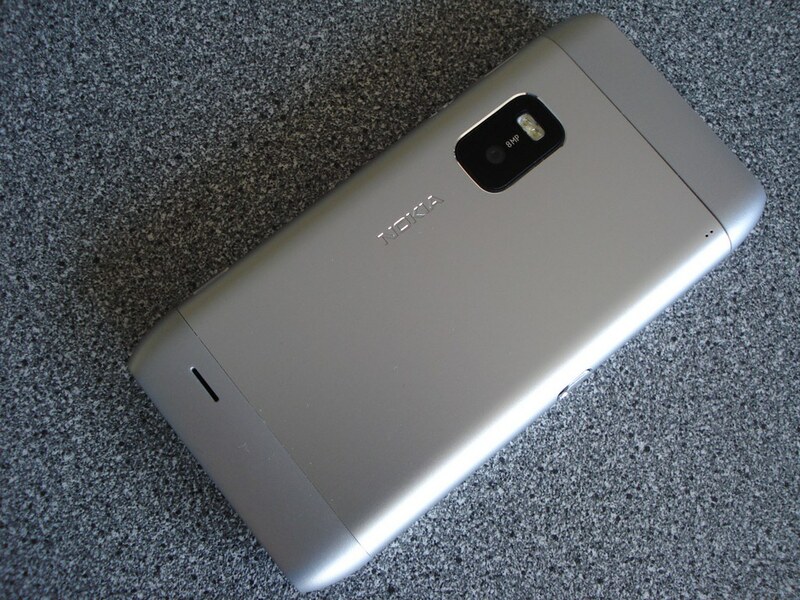 Before actually looking closer, the impression is you’ve just committed yourself to a cheap Cseries phone. Can’t say it’s a good thing, especially if we take into account that the E7 is anything but cheap. A little more glamour to present this flasghip phone to the consumer wouldn’t hurt, I think. Chunks of text at the back of the box explaining features of the phone are not present this time: instead, the user has to decipher the information from the small column of icons. I do like the idea of introducing the features through showing rather than telling – it’s a much more powerful tool of persuasion I believe, although at the same time it’s quite tricky to achieve right. Overall, the box is very simplistic, almost borderline tasteful. Call me old fashioned (and probably not very eco-friendly) , but I still prefer having large, glamorous boxes, especially for my expensive purchases, that would jump-start my impressions into the high-note straight away. Aside from some incredibly basic looking hands-free earphones and a charger, there’re adapters for HDMI-out and USB-To-Go functionality included in the package. Luckily, the provided microUSB data transfer cable comes in standard length. There’re no manuals to be found (a digital copy can probably be found on the 16GB mass memory of the device). A leaflet with instructions on how to operate the slider and fit the SIM card into a slot can be found, but other than that, there’s no paperweight to be found whatsoever. All in all, the retail box contents covers all the basics, but it does make the whole unboxing process rather boring. First thing that pops in my mind when taking the device out of the box: ”it’s rather heavy”. Second: it’s quite sizeable ‘little’ monster. The aluminium unibody shell assuringly cools my palm. You see children, it’s not a toy. The phone is incredibly smooth on the surface: there’s nothing that sticks out of the device when in closed form, and that definitely goes towards making the device as pocket friendly as physically possible. I’ve taken the time to reach for my HTC Desire to compare the two in each hand: my phone does feel like cheap plastic toy in comparison. While it’s also smaller than the E7, the thickness is about the same: quite an impressive feat for a slider phone, so props to Nokia engineers for pulling this off! Either in open or closed state, The E7 feels consistently solid as well: nothing wobbles or feels out of place. And I would be greatly surprised if I hadn’t witnessed this before with the Nokia N8. 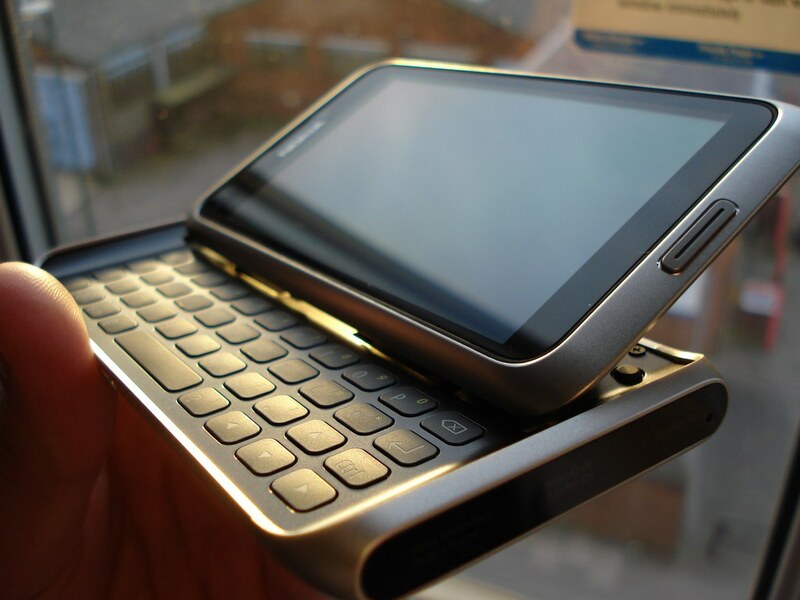 The latest Symbian smartphones leave little to be desired in terms of built quality – a step forward that cannot be overstated. There’s a gap between the two parts of the slider, however this does not seem to effect the built quality. Curiously enough, the slider does seem to be a bit different from my previous encounter with the E7 at Nokia World last year. 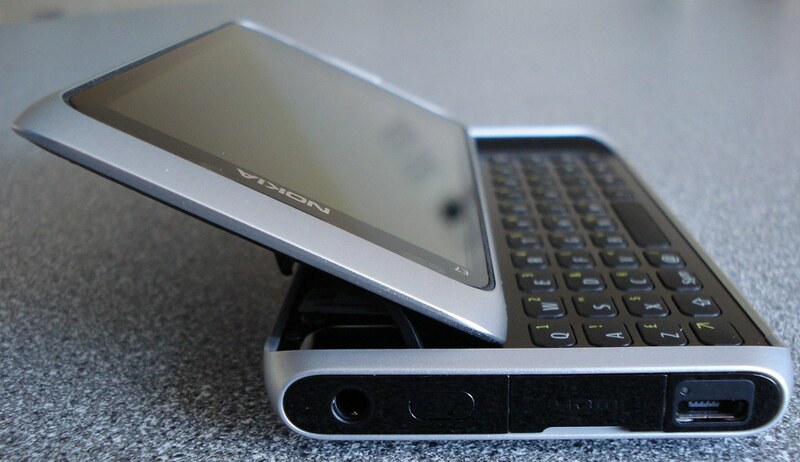 Back then, I was forced to push the upper part slightly from the top, rather than from the sides you normally would (like with the N97 for example). This unsurprisingly almost resulted in me making the rather heavy device airborne. This time, however, pushing the slider from the side of the screen was easier, although certain confidence is still required when engaging the slider during first hours of use. Still, opening the device with one hand is mission impossible. A worthy trade-off in making the device more slimmer and attractive looking, I think. For better or worse, I’ve read reports on twitter that the slider will become more forthcoming with longer use – something I will have to keep an eye on during my two week trial period. Having pushed the slider for about 5 mm, the hinge takes over, and with an audible “flop” the screen locks to a comfortable 30-ish degree angle. Closing the device is easier, and more satisfying to watch as the 4 -inch screen smoothly folds back and blends naturally with the rest of the device. It takes a moment to apprehend just how great the qwerty keyboard actually is. The keys here are perfectly sized and have an excellent tactile feedback. The generous spacing between each key actually takes a little getting used to – it’s not usual for me to have so much freedom and comfort on a mobile phone. 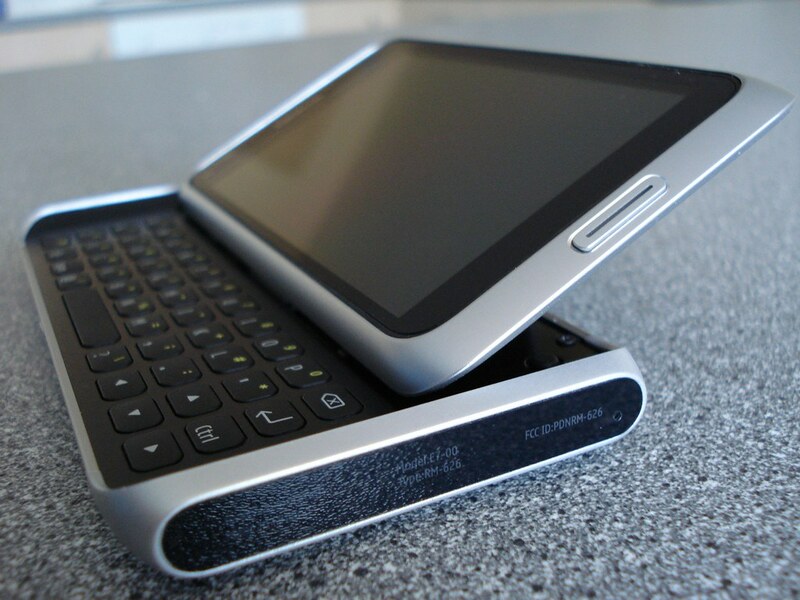 It’s quite obvious Nokia had spent a great deal of time making the keyboard work and feel just right. Needless to say, I’m quite excited to try writing a few docs and spamming twitter with this 4-row full qwerty beast. The volume “slider” feels like an unnecessary departure from the traditional volume rocker found on the Nokia N8, for example. It’s similar to the screen lock switch found on the left side of the device, but this one can travel in both directions. The decision to have such small controls on a sizeable device like the Nokia E7 is unclear to me. I do like the grip of these controls. Annoyingly, the screen lock switch resides on the left side. A more comfortable position would be either on the right side, so I would unlock the device with my right thumb. While you can turn on the screen using the power switch, it still requires you to deal with the lock screen. I also predict that new users will initially reach for the volume controls to try to unlock the device because of it’s intuitive placement just under the right thumb. It’s quite confusing at first, but nothing deal breaking. 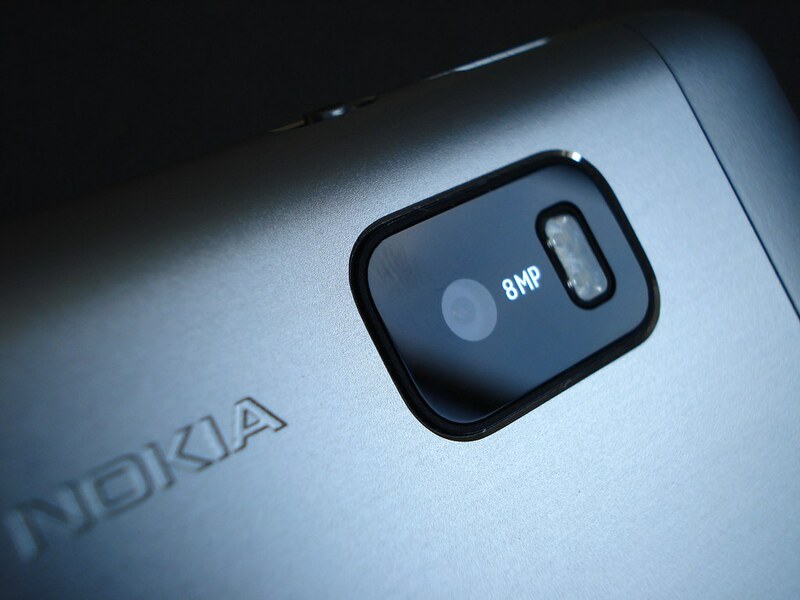 I think Nokia would do well to continue exploring the design philosophy of the N8 and especially the E7 for it’s future Windows Phone and MeeGo smartphones. It’s got a winner looks, and expanding this with equally modern software would be a match made in smartphone heaven. Turning on device makes the size of the screen look even more impressive: this is, after all, the largest screen to ever grace on Symbian touch interface devices. Like the N8, it’s impossible to switch the battery on the go. The Sim card, though, is easily accessible via an external slot next to the volume controls. There’s a mono speaker at the back of the device. It’s position on the slope helps the sound travel with almost no interruptions even when the device lies on flat surfaces. Although the loudspeaker is powerful enough, it lacks the depth of dual speakers of the N900, from my own experience. What’s even worse, my fingers were blocking the loudspeaker almost entirely when holding the device horizontally. The audio output through the 3.5 mm port is exceptional. For such business oriented device as the E7, this is a remarkable feat. The vibration feedback of the touchscreen feels awkward: it’s rather weak and quite worryingly makes strange clicking noises. This sometimes happens on low battery charge, but this is not the case here. The pre-installed themes showcases the superior contrast of the new ClearBlack display from Nokia, but other colours seem quite bland, especially for an AMOLED display. I installed a 3rd party theme from Babi (as seen in the screen below) and the screen immediately came to life. The clarity and view angles of the screen are awesome, hands-down. Sadly the nHD resolution shows it’s age on the massive screen of the E7: the icons, fonts and other UI elements look a bit rough around the edges, and generally not as accurate looking as I’m used to on my HTC Desire, and especially on iTouch 4th gen. Could this be the legacy of a dated looking operating system or the low resolution of the screen? I think it’s a combination of both. In most cases, the screen looks crisp, but there’s a LOT of unused space on this 4 inch touchscreen. From what can I gather, the 8Mpix camera sensor is equally underwhelming as on the C7, but I’ll be sure to put it through it’s paces anyway since I enjoy snapping picures. Even if they probably won’t turn out as good. But there’s hope to be found, still – the camera is supposed to record 720p videos at decent framerate. That’ll do for my impressions on the Nokia E7 for now. Next in line is to have a closer look at the built-in software and the hardware performance (as well as HMDI out and USB On-the-go functionality), and examine the selection of Symbian^3 apps on the Ovi Store. The E7 review coincides with my plans to work another project I had on my mind for quite a while, so it’s suffice to say I’ll try brining those two together for some interesting results in one or two weeks time. Thanks for reading, and good luck! 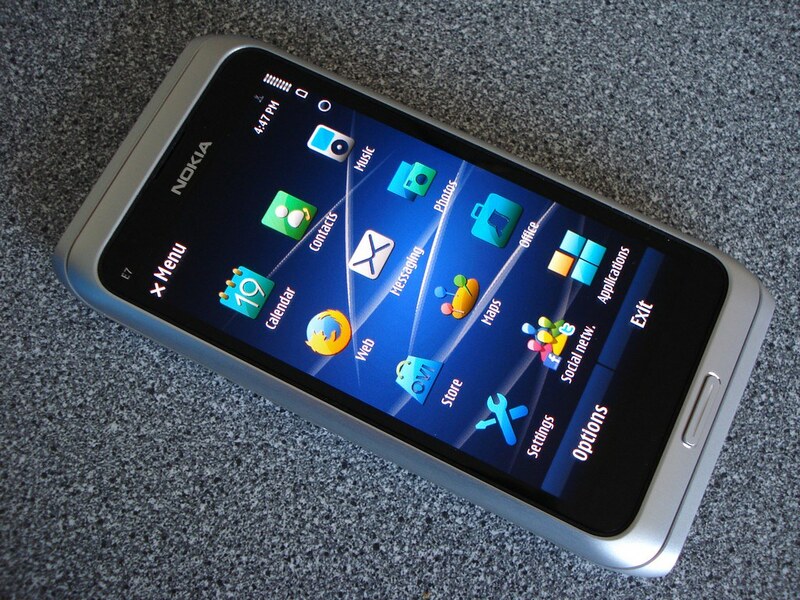 Special thanks to WomWorld/Nokia for the opportunity to trial the Nokia E7! 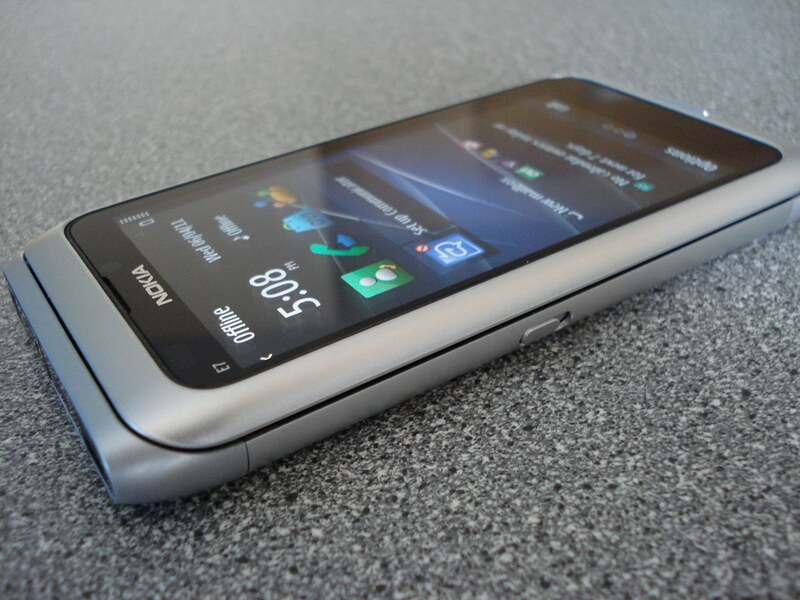 « HTC Surpasses Nokia’s Market Value? Ahem. Well, no, not anymore.